Casa Universitaria del Libro. Part of the Roma Walking Tour. Photo via Wikimedia Commons. Zoe Mendelson is a an architecture and urban planning professional who’s worked with the Mexico City government, several architecture firms, and The New York Times on various urbanism projects. Here, she details two of her favorite self-guided walking tours in Mexico City that offer a robust architecture intake in some of the city’s coolest neighborhoods. When I first travelled to Mexico City in 2013, I quickly fell in love with the architecture. The city is full of different eras crammed together: futurist Art Deco, classically ornate Colonial and Neo-Colonial, and minimalist Mexican Modern. The mashup is part of what makes Mexico City so surreal. I stayed in the city for ten days, went back to New York, and couldn’t stop thinking about going back. I moved to Mexico City a few months later. As far as walks go, these are two of my personal favorites, cultivated over years of speaking and working with architecture and urban planning experts. At its best, architecture is a way to uncover new layers of a city that seems infinite and is infinitely complicated. I’ve noted a few of the buildings you’ll pass, but the two routes are full of many more gems that you’ll see along the way. Pro tip: For long days walking around Mexico City, take the elevation seriously. Mexico City is almost 2,000 feet higher than Denver. Many tourists find themselves suddenly extremely parched or unexpectedly sunburnt. The thick pollution doesn’t help. Wear sunscreen and drink a lot more water than you think you need to. Inside this trendy neighborhood, you’ll find a mix of styles. You can understand the architecture of La Roma in two periods: 1903-1950 and 1950-1985. The first period was the beginning of Roma, a settlement subsidized by Mexico’s lavish dictator Porfirio Diaz, with boulevards inspired by Paris, and Neo-Colonial and Belle Époque mansions. Much of the architecture is borrowed from a mix of ornate European styles from across time. After the revolution, in the 1920s and 1930s, a less ornamented, aristocratic modernity was fashionable and Art Deco came more into style. Post 1950, Roma stopped being a rich neighborhood. Modernist apartment buildings were built for the middle class. Aging mansions were more expensive to maintain than to destroy, so during this period, much of La Roma’s original architecture was lost. The 1985 earthquake destroyed and damaged a huge amount of what was left. But with post-earthquake building codes, a new interest in the area from young artists, and a new governmental interest in preserving the area, La Roma began to repopulate and rebuild. Walking around, you will see buildings from the second era all around you, but this tour will highlight buildings from the first. 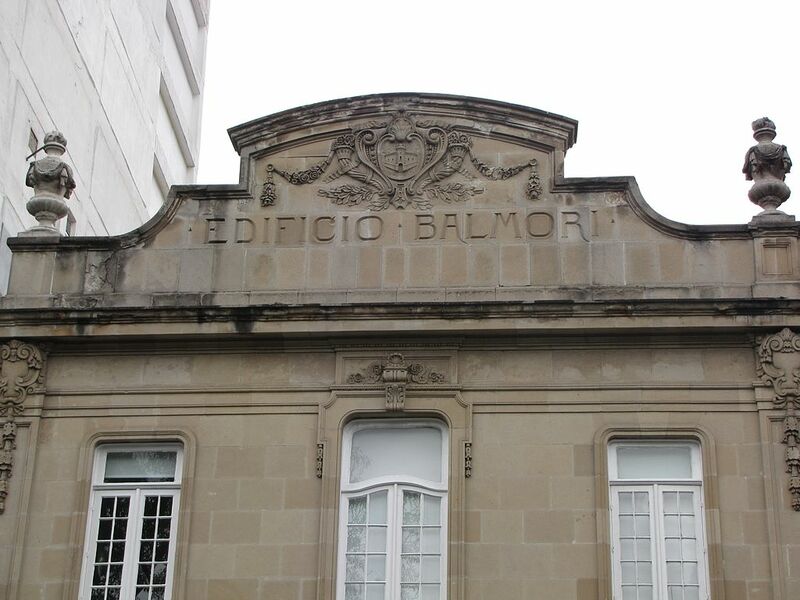 Edificio Balmori. Photo via Wikimdia Commons. A perfect example of Art Deco, check out the lettering spelling the building’s name on the front, center balcony. Keep your eye out for this beautiful lettering on other Art Deco buildings as well. Originally an old beautiful theater in the 1930s, this eclectic but mostly French-inspired building was restored in 1991 after the earthquake. Originally built as a house, this is a characteristic of Roma mish-mash of styles. Known as the witches’ house because of its witch hat-shaped roofs and windows that look like big scary eyes (and because it was once home to a revolution-era shamanic woman, Bárbara Guerrero). One of Roma’s first buildings, it was originally apartments that each had one floor. Its style is post-industrial revolution mixed with gothic and French colonial. Another example of a totally eclectic mix, this building, which was designed by the same architect who did the church, was used as a community center for many years. In 1986, after the earthquake damage, it was donated to UNAM, Mexico City’s giant public University, which restored it and turned it into a center for the promotion of books. This Neo-Romanesque but also kind of Neo-Gothic mixture of a structure was La Roma’s first church. Notice the Italian stained glass windows. Casa Lamm. Photo via Wikimedia Commons. Further away from the hustle and bustle of Mexico City, the architecture in Coyoacán is way older than in La Roma for the most part (so most of the architects are unknown). This is a great tour if you’re planning to go to Casa Azul (The Frida Kahlo Museum) during your trip. You can easily do them on the same day as it’s a short walk from the museum. This area was where Khalo and Diego Riveria steeped deeply into Mexico City’s counterculture in the 40’s and early 50’s, before it was full built up and populated in the 1970s during a time of rapid urbanization in Mexico. 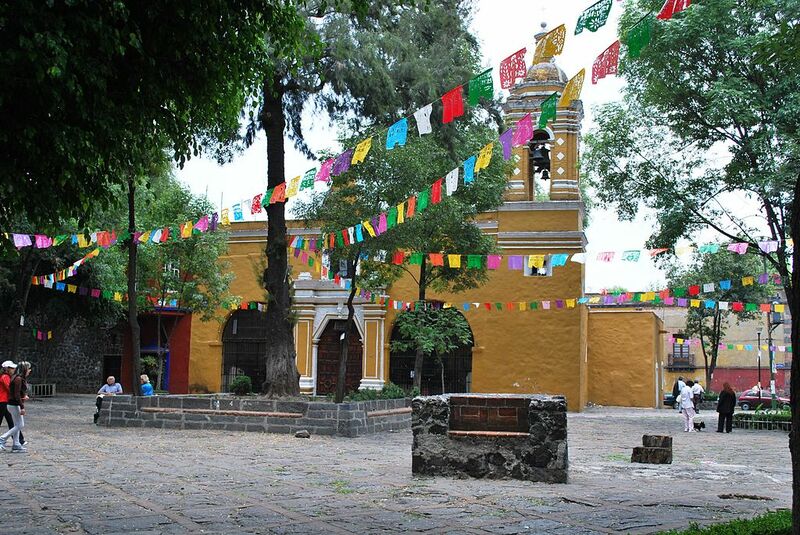 Coyoacán became a borough of Mexico City in 1928, but operated as its own little town before then. Even in pre-Hispanic times, Coyoacan was a Tepanec village, not part of Aztec Tenochtitlan. The Aztecs were awful neighbors, so when Cortez, the conquistador who claimed Mexico for Spain in the 1500s, came talking about overthrowing them, the Tepanec welcomed him in, and he set up camp there while plotting. Fun fact: Coyoacan was actually the capital of New Spain from 1521 to 1523. The farms and lakes may be gone, but two relics remain: pre-Hispanic street grids and colonial architecture. Fuente de los Coyotes. Photo via Wikimedia Commons. 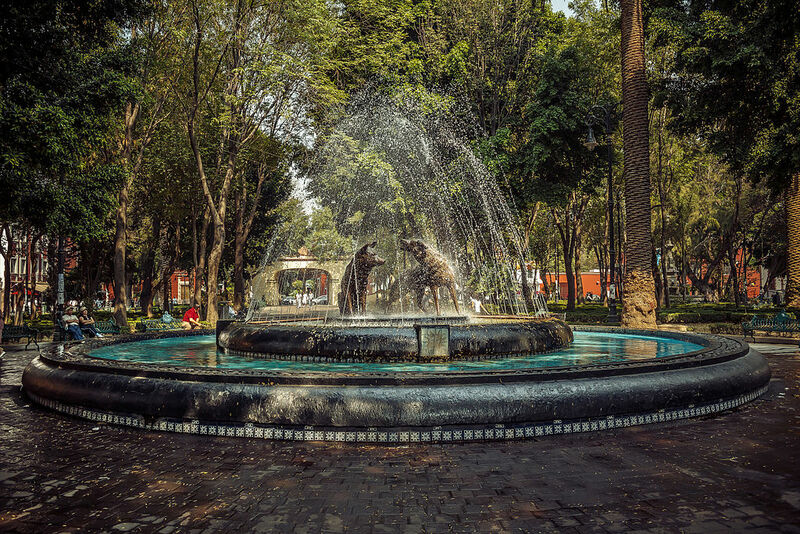 Head to the big fountain with two coyotes on it in the central plaza of Coyoacán’s southwest quadrant and have a look around the plaza. The Spanish believed in the central square as a means of “civilizing,” so they put a central, geometrically “rational” square or rectangle where they would locate a government building and a church together to try to bring “order” to their new settlement. This house with a Mujédar (post-Moorish) facade was long believed to have belonged to Diego de Ordaz, a Spanish captain who accompanied Cortés during the conquest. Actually, it was built after he died. Mujédar style comes from Spain. 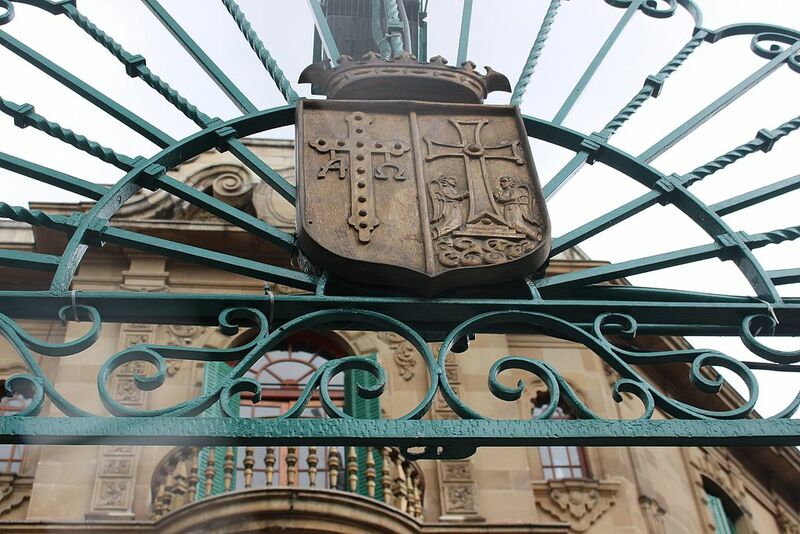 Its beautiful details are strongly influenced by Moorish workmanship. The color is believed to be the building’s original color (although not the original paint). This is the Instituto Italiano de Cultura. Sitting inside a 18th century convent, it’s open to the public sometimes and there’s a beautiful garden inside if you want to take a peak. Take this route if you want to see some of the beautiful urban fabric, built on the old, windy, narrow streets of a pre-Hispanic village. First, take a left on Pino Street, then follow it down past the park, and take a left onto Aurora. Follow Aurora until you reach the little fountain, and veer left onto Truenitos Street (there won’t be many visible street signs, however). The road gets split at Artes Street but continue north on Pino (yes, a different street called Pino), then take a right and then a left on Reforma (yes, a street that turns). Then take a left on Cerranza, and take it all the way back to the original park off Pino 1. It’s okay if you get lost, just make your way back to Sosa 77! Peek inside the chapel which was built in the 1520s. You can also find a bust of Francisco Sosa himself, who was a resident and historian of Coyoacán. Casa Emilio El Indio Fernández (only open Saturdays and Sundays and for a few weeks around Día de los Muertos), this house, which was designed by Manuel Parra in the colonial style, but with volcanic rock. It originally belonged to the famous Mexican actor Emilio “El Indio” Fernandez. During Día de los Muertos, it is filled with gorgeous ofrendas to Mexican writers, actors, artists, and musicians from the early and mid 20th century. Construction started in 1946 and is said to have continued until El Indio died in 1986—perhaps why the architect is buried in the garden. 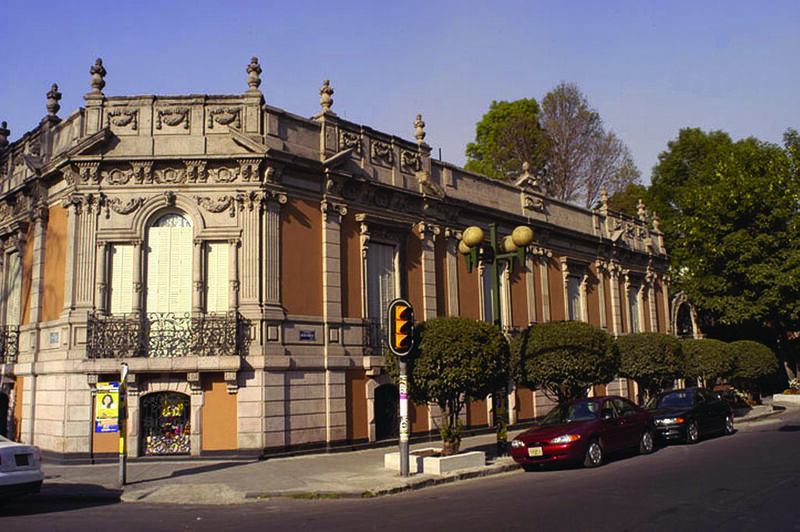 This building, La Casa Alvarado, has housed the Ministry of Finance and Public Credit’s library, the Ministry of Public Education’s bookstore, the headquarters of the Encyclopedia of Mexico, and the Octavio Paz Foundation. It is currently the Fonoteca Nacional where you can find the national sound archives and audio library. The building, similar to the Instituto Italiano is from the 18th century, and is influenced by Moorish style brought to Mexico by Spain. Santa Catarina Plaza. Photo via Wikimedia Commons.